You may be surprised, or even shocked, to hear that many mass-market vitamins contain heaps of sugars and other additives. As the leading brand of ethical vitamins, here at Viridian Nutrition, the entire range is free from excipients, added sugar, preservatives, additives, artificial colours or flavourings, binders or fillers. No doubt, you are choosing food supplements for you and your family for a number of reasons, either as an insurance on top of an already healthy diet, to avoid deficiencies, or to address specific health issues. Therefore, your expectation is for the supplement to provide the key nutrients, the active compounds and nothing else. However, sadly this is often not the case. Inactive manufacturing aids, also referred to as inert ingredients or excipients, are commonly found in food supplements. These are added during the manufacturing process to speed up production or to improve the taste or appearance of the tablet, capsule or liquid. These additives include binders, fillers, dyes, preservatives, flavouring agents, artificial sweeteners and even sugar. When reviewing a food supplement, it is important to check the full ingredients list which by law must highlight every ingredient in descending order starting with the ingredient which is contained in the highest amount. Other ingredients: sugar, glucose syrup, water, pectin, citric acid, sodium citrate, natural flavours (blue raspberry, cherry, pear), natural colours (black carrot, annatto, genipap juice concentrate), watermelon juice concentrate, vegetable oil (coconut source), carnauba wax. Other Ingredients: Cane Syrup, Tapioca Syrup, Pectin, Citric Acid, Maltodextrin, Purple Berry Color Concentrate (Maqui Berry Juice Concentrate, Sugar), Black Carrot Juice Color Concentrate, Silica, Natural Flavors, Turmeric Color, Mannitol. Contains fish (tuna and tilapia). Ingredients: Glucose Syrup, Sucrose, Gelatin, Water; Less than 2% Of: Artificial Flavors, Ascorbic Acid, Bees Wax, Carnauba Wax, Citric Acid, D-Biotin, D-Calcium Pantothenate, FD&C Blue #1, FD&C Red #40, FD&C Yellow #6, Folic Acid, Potassium Iodide, Pyridoxine Hydrochloride, Vegetable Oil (coconut or palm), Vitamin A Acetate, Vitamin B12, Vitamin D3 (Cholecalciferol), Vitamin E Acetate, Zinc Sulfate. Ingredients: Glucose Syrup, Sugar, Water, Beef Gelatin, Citric Acid, Lactic Acid, Glazing Agent (Vegetable Oil, Beeswax), Ascorbic Acid, Natural Flavours (Strawberry, Lemon, Orange, Pineapple), Natural Colours (Lycopene, Beta Carotene), D-Alpha Tocopherol Acetate, Calcium Pantothenate, Retinyl Acetate, Vitamin D3 (Cholecalciferol), Folic Acid, Vitamin B12 (Cyanocobalamin). With increasing amounts of sugar found in the food chain[i], additional sugar is certainly not needed in food supplements. 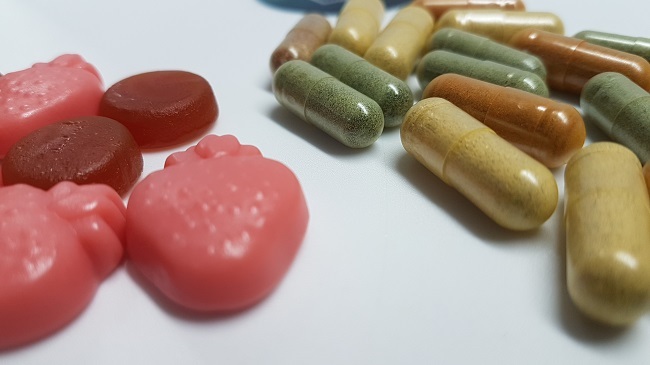 High intakes of sugar have been linked to numerous health conditions including diabetes, obesity and heart disease[ii] so when taking a food supplement to improve your overall health, it makes little sense that the supplement should contain any level of sugar. At Viridian Nutrition, our message to you is ‘read the label’ – carefully - as many companies choose to have two ingredients lists – one featuring just the actives, and a second listing the full ingredient list including all the nasty additives. At Viridian, our clean labels show our commitment to 100% active ingredients, no nasties whatsoever. [ii] Johnson RJ, Segal MS, Sautin Y, Nakagawa T, Feig DI, Kang DH, Gersch MS, Benner S, Sánchez-Lozada LG. Potential role of sugar (fructose) in the epidemicof hypertension, obesity and the metabolic syndrome, diabetes, kidney disease, and cardiovascular disease. Am J Clin Nutr. 2007 Oct;86(4):899-906.